Wow, #JAMIROQUAIDAY is coming to an end! It went by a lot more effortlessly on my part than any of the previous Artist Appreciation Days, but now I’m going to start something a little new (that hopefully will carry over into my regular blog traditions). Back in the day, I made mixtapes and with the tutelage of my late Aunt I became an expert. It’s all about putting the right songs on there and putting them in the right order to get the best flow. When the digital age came around, I carried what I learned over to my iTunes playlists and it was great because they were like mixtapes with no time limit. 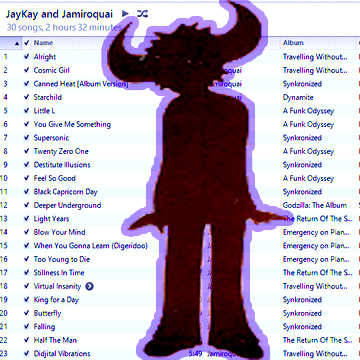 One of the playlists I made a long while ago is my Jamiroquai mix, which I must have made around 2007. It’s one of the few that I haven’t changed, and one of the few that spends A LOT of time on my iPhone because the mood might strike and it’s just the perfect background music for different moods. I probably do need to update it a little bit given the fact that I just downloaded their latest album “Rock Dust Star Light” earlier this week, but until I do that let’s get into this, dissecting the Playlist. Enjoy! This is the perfect starter, because although the song is VERY upbeat and fun, it doesn’t begin that way. There’s a slow build up to the first Disco-beat drop, and I thought that was perfect for opening up the album. Also perfect because I decided to start this playlist off on a very Funk-Disco-Dance note and the songs that follow fall under that mode. Very uptempo (the tempos increase as you’ll see) and very fun, a great way to get things started. Now we transition from Disco into more Electronica sounds, with “Supersonic” being the perfect song to segueway because it has elements of that Disco Funk we started with, but definitely has heavy Electronica elements. It feels a little bit like Time Travel now, we started in the 70’s with lots of Disco sounds and than we moved straight into the future with grunge-y futuristic Electronic sounds. With “Light Years” we move back into the past, and more into the heart of Jamiroquai as we explore the more laid-back groovey records that may or may not have a social message hidden underneath the infectious flows. This block serves as a break from the high tempos and heavy synths and things of the first half of the playlist. Big hit singles like “Virtual Insanity” are necessary on any playlist, and they can serve as a sort of anchor for the list. For this playlist “Insanity” serves as a bridge between the bands upbeat material (because the song does still have a nice dance-able tempo, even if it is a mid-tempo track) and their more mellow slow songs. “King For a Day” is a good transition, it somewhat matches the tempo of “Insanity” but the tone is a lot more dark and love-related so it helps to blend into the beautiful ballads like “Butterfly” and the few slow jams that follow. Let me explain. First of all, can a song have a more perfect title than “Seven Days in Sunny June” because the vibe of this song is simply SUNNY! While this definitely fits in with the feel good laid back songs that came before it, what this song does in the playlist is provide a nice high before we get incredibly low with some VERY slow songs that follow. “Corner of the Earth” for example is a great song, but it’s really slow and a little sad. So NOTE, if you are going to get very melancholy on the playlist, you should provide something upbeat or positive to break up the monotony. I’m always here for ending a playlist with a very popular hit single, like “Cowboy”, which is kind of their anthem at this point. For me, it’s a great (almost) end to the playlist because it’s the ultimate in chill-music and it provides some upbeatness after that big block of slow songs. I feel like it transitions well from “Morning Glory” and it’s a good closer because I imagine they’d probably save the song for last on one of their concerts. But this is the ACTUAL end of the playlist. I felt like this inspirational and upbeat song is short enough to be like the Encore to the playlist. And if you happen to have the playlist on “repeat” than the song actually goes nicely into “Alright”, so it’s a total win-win! So I hope you guys enjoyed that. Once I figure out how to embed full playlists from Spotify onto this blog, I hope to do more of these THEPLAYLIST posts! Until than, have a great Tuesday. Hope you enjoyed #JAMIROQUAIDAY ! Share it with a fan!